Coralville’s newest addition to the Iowa River Landing District is taking the next step towards reality, as the Iowa Arena Project was officially named. 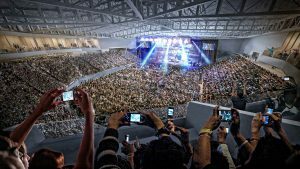 The city of Coralville announced that they reached a ten year agreement to name the new arena Xtream Arena powered by Mediacom. So far the sell has already been easy for Hixenbaugh and his company Spectra. The city of Coralville unanimously approved the project in 2018 taking the over $70 million costs head on. 180 acres right in the heart of the Iowa River Landing will complete the areas transformation, as the arena will also include an attached hotel several retail spaces and other amenities. The city did receive state funding for the project and also gained support from private investors. The naming rights will provide another boost in completing the project on time. The University of Iowa volleyball team will play its season here once the arena is finished in 2020. They also hope to attract a semi-pro or pro hockey team to the area with several USHL teams already in the Corridor. For Hixenbaugh however it’s not just about the events and tournaments the project will attract. He hopes it will become a central part for corridor communities all across the area.